While a car says: Me. I’m lucky enough to go to Ty Newydd a couple of times a year. From Cornwall, it required a huge dog-leg of a drive and I often used to take two days over it, staying with friends en route. It was a slow-quick-very slow kind of drive (slow the length of Cornwall, a quick nip up the M5, then very slow across Wales and over the years, I tried many different routes). From East Kent, the mileage is exactly the same but it’s motorway almost all the way – a straight diagonal from one corner of the UK to the other. My last visit was a short one and I took the train to Bangor. Thanks to the high speed from Canterbury and the short walk from St Pancras to Euston, it was only a five hour journey, even allowing for the stopping train with its spectacular views along the North Wales coast. Then …. Llanystumdwy is 25 miles from Bangor. I was the only one arriving at that time and a taxi seemed an extravagant use of funds. I’d researched the buses and it seemed that I could make it on a combination of three different routes, involving changes at Caenarfon and ‘Australia’. No one was expecting me that evening so time didn’t matter. For many of us who grew up in villages at a time when parents didn’t see their role as taxi drivers in service to their children, buses offered transport in all senses of the word. Bus shelters were where much teenage social life was transacted and even now, fancifully, I have a feeling of bus routes being like songlines in our culture. And the people that know them are out of the mainstream, and all the more interesting for that. I’m also aware that I’m saying that from the perspective of a car owner with choices, not often at the mercy of unreliable buses. 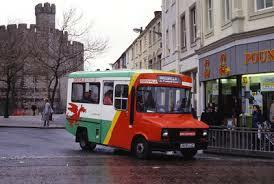 The T2 was a smart bus with quiet solitary people going all the way to Aberystwyth. The driver and his friend though said I would be better off on the number 1 – which was somewhere ahead of us – I could change in Cricieth and avoid Australia all together. The 1 was detouring to villages, the T2 trundled along the A487. Eventually, we caught up with it – the driver was flagged down and I got into a noisy, fugged-up, crowded proper bus full of kids going home from school. It could have been the number 10 of my teenage years but for the Welsh and the texting. I agree with you about buses, and yes the bus stop, like the bike shed, was where it all happened. For eight years, we wreaked havoc on the buses that we took to and from scholl, to the extent other users often wrote letters of complaint to our headmaster, which he in turn read out in assembly. Now however, my parents, 90 and 80yrs old, made the considered decision to take a taxi yesterday because it was cheaper than the available buses. And why didn’t they use their bus passes, you ask? Because, whilst the bus operating in South Bucks would have been free, they would have had to pay for the one operating in the London area.